The sun is shining. 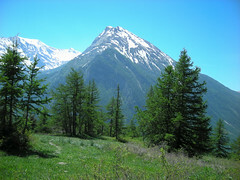 There has been plenty of snow melt and the mountain pastures are lush with vegetation. The Alps are blooming lie they have never done before. At this time of year the alpine pastures become full of Gentians, orchids, daisies and other colourful flowers. It is an ideal time to explore the area just before the farmers take their cattle up to graze. A floraphile's delight!